Who should use Plexus Edge? Professionals, parents, college students, artists, gamers, weekend warriors – anyone needing long-lasting energy and focus will benefit from Plexus Edge. Edge is also a great preworkout for athletes and those looking to make the most out of their gym time or physical activity. * Edge is not intended for pregnant or nursing mothers and those under 18 years of age. Can I take more than 1 capsule of Plexus Edge daily? One Edge capsule is great for the average person looking for long lasting energy and increased focus. * However, you may safely take up to 2 Edge capsules when using Edge as a preworkout. Can I take Plexus Edge with other Plexus products? Yes, when taken at the recommended dose of one capsule a day, Edge is safe to take with other Plexus products. How is Plexus Edge different from Plexus Boost and Plexus Accelerator+? Can I take Plexus Edge with my cup of coffee? Yes, it is safe to take Edge with a cup of coffee. While many consumers use Edge as a replacement to coffee, the amount of caffeine when consumed together is within normal levels. 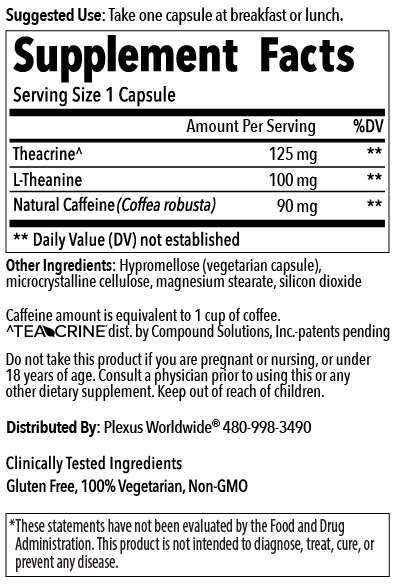 How much caffeine is in Plexus EDGE? The amount of caffeine in EDGE is equivalent to one cup of home-brewed coffee (approximately 90mg). The lot number is a 7 digit number found on the bottom of the Edge bottle along with the expiration date of the product. Yes, Edge is safe. Plexus meets or exceeds all regulatory standards and guidelines for product safety and efficacy.